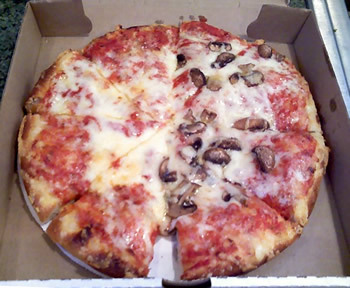 This Is Framingham » Pizza quest! I couldn’t believe it. Such a beautiful sight! It was only last summer that Ethan and I got to know the awesomeness of Bronzetti’s pizza, over by the Temple St. part of Rt. 9, but sadly our new favorite treat silently disappeared in July. The bar changed it’s name to something generic and, as others have commented, so did the pizza. 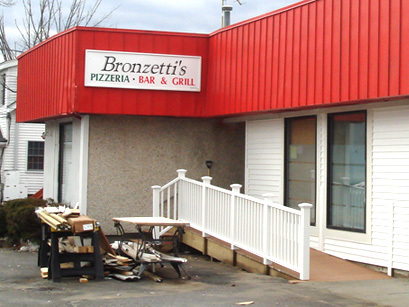 Oh Bronzetti’s, we hardly knew ye! But now I can look forward to the day I will hold a slice of heaven to my lips once again! Don’t let the messy looks fool you, with it’s light but chewy crust (and just enough crunch!) 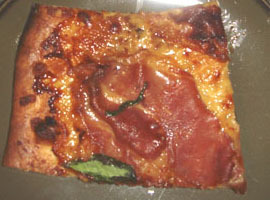 and melty goodness all over, this is pizza of the Gods. I normally avoid Rt. 9 but I will try to keep track of this progress and report when I find it up and running. Maybe they can take over the “Grand Opening” sign from PC Healthstop to let us know. 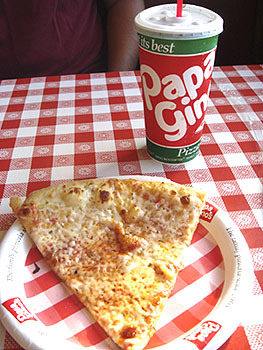 I used to love Papa Gino’s as a kid then sometime in my early 20’s I became a bit of a food snob and refused to go there. I remember reluctantly going to Papa Gino’s when Ethan suggested it when we first started dating, I’d roll my eyes and say “if you REALLY want to” but after the first few times I realized that I DO like Papa Gino’s. There is something comfortably consistent about the pizza and the whole operation. 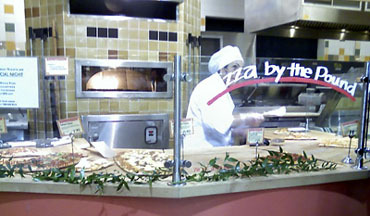 The smells, checkered tables and sounds of order numbers called through the microphone are reliably part of the whole Papa Gino’s experience. 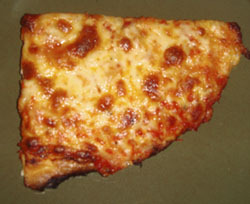 We just got a couple of slices of cheese pizza. As we waited for our number to be called, I thought it might be fun to get a job here just to call numbers really close into the microphone so it’s all fuzzy like “Number FVZE FOOVM” but I think the humor in that would wear off fast, and I’d be a jerk but I wonder if it’s fun to make the pizza especially since little (and big) kids get to watch through the window. 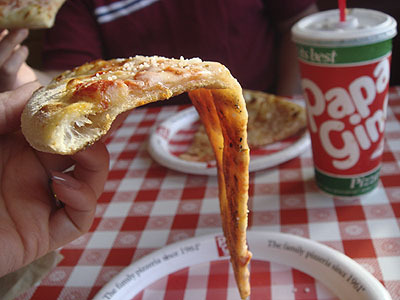 That used to be one of my favorite things about Papa Gino’s as a kid was watching the pizzaguy throw the dough in air and make the pizzas. Our slices were decent sized and mine flopped down when I picked it up and the sun penetrated right through it like it was paper but it had that reliable familiar taste I become re-acquainted with (after Ethan got me back on track). I’d also like to note that I think root beer best compliments their pizza. The only thing I think they could improve on is bringing the tableside jukeboxes back. Papa Gino’s isn’t the best pizza but that’s okay. I give it a thumbs up for consistency and nostalgia. I’m sorry Papa for ever doubting you! 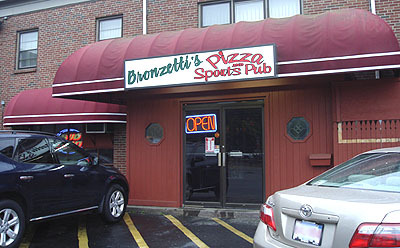 I have heard good things about Bronzetti’s pizza. I was told they bought the recipe from the Union House and make those pizza’s there and that they’re excellent, so of course we had to try it. Bronzetti’s is not a place I would normally think of going to, it’s kind of the unofficial restaurant of the Econo Lodge which it seems to be attached to. Inside is a no frills sports bar, but I really like the lacquered wood bar that includes the tree bark all around the perimeter. 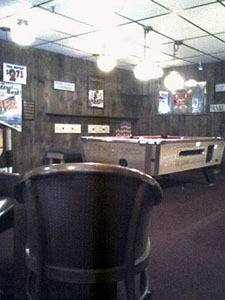 There are pool tables and “4-top” tables with castered chairs to sit and eat at . 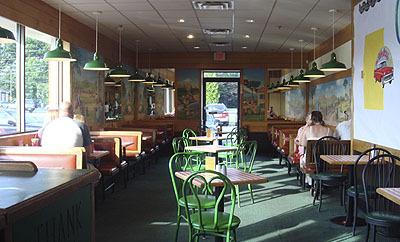 I also liked the wood paneled walls and that the place is entirely lit by hanging glass lamps. 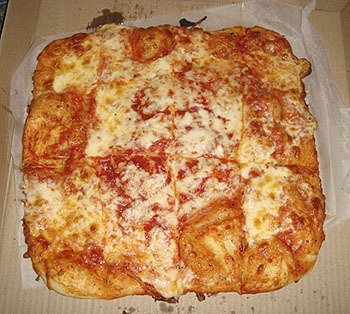 We got the pizza home and wasn’t sure what to think at first because it was messy looking but it was delicious. The dough is crunchy on the edges but just chewy enough everywhere else. 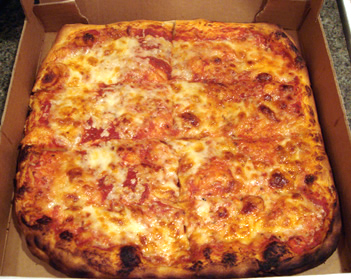 It’s almost like there’s butter in the dough, the sauce and cheese were great too, all together it’s a great pizza! Ethan was so impressed with the pizza he suggested getting it again the next night, so we did. A definite “yay” for the pizzaquest! 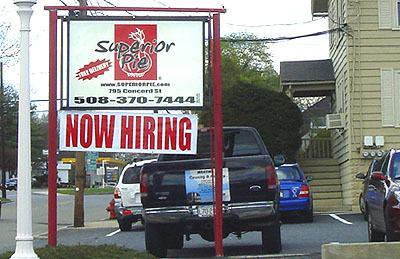 Or it could be open by now, but last week I was going by the old “Ryan’s Pizza” and saw a new sign up for “Superior Pie”. I was thinking it could just be the same owners opening under a different name but they have a website and there are pictures of the food on there that don’t look like Ryan’s pizza. They also have their full menu online and will have a function on there to be able to place orders online too. Their about page is nice to read too, sounds like this place will be worth trying! 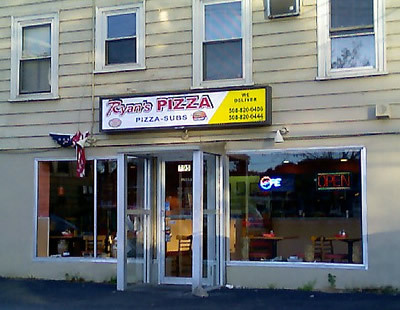 Ryan’s Pizza 795 Concord St. The new “400 Plus” restaurant at 430 Franklin St.
is now open for business and we got a pizza from there tonight. 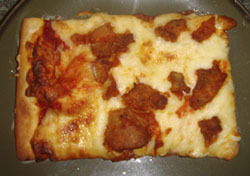 well seasoned with just enough oregano and had a nice blend of cheeses. be getting pizza from here again. Last night I decided to see if Whole Food’s new (well a few months old now) house pizza was any good. They sell it by the pound or by the whole pie but I wanted to bring home a little tasting so I got a few different pieces. I got prosciutto and fig, buffalo chicken, pepperoni and plain cheese. The prosciutto and fig was interesting, it was sweet from the figs and salty from the prosciutto. Ethan thought the buffalo chicken would have been better with white meat and I would agree that it was a little disapointing that they used dark meat for that. 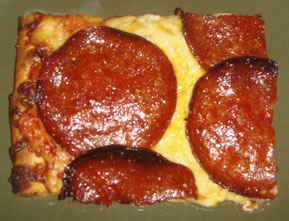 The pepperoni had plenty of large circles that covered the slice and tasted like what a pepperoni should taste like. The Cheese was probably the best next to the prosciutto and fig. Simple but satisfying. The people working there are very friendly and happy to explain how buying pound vs pie works and that on the weekends after 5 you can buy one pie and get a second for half off. They heat it up for you if you want and will cut from the middle if you don’t want a lot of crust. Final thought: Not bad, the crust was nice and crunchy, which I like. The dough for this style of pizza might have complimented it more if it were thinner but it’s pretty good. It probably won’t be the first place I think of to get pizza but maybe as a treat for the prosciutto once in a while.